OLD PARKED CARS. 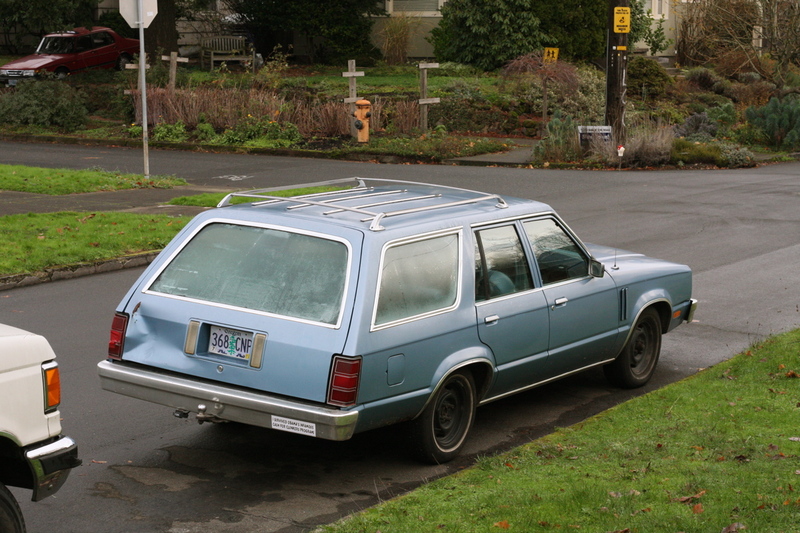 : 1979 Mercury Zephyr Wagon. 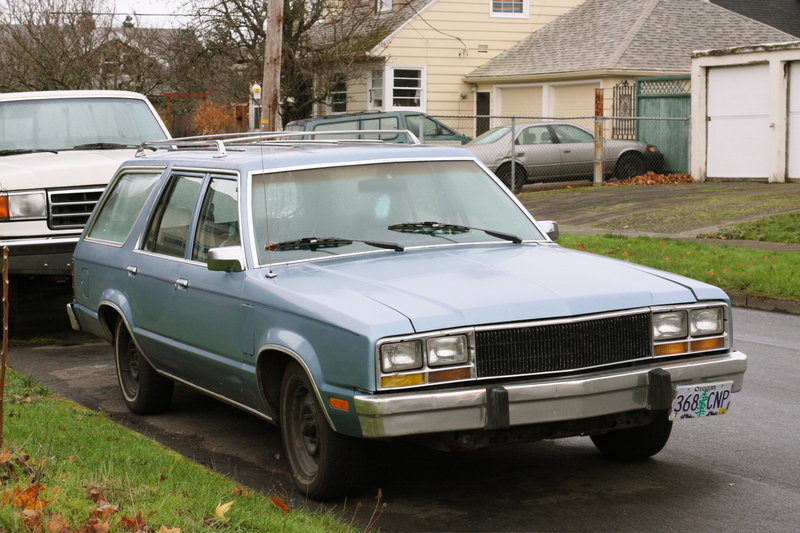 There was such a big buildup before Ford introduced the Fairmont/Zephyr twins. They were gonna be the best thing ever. And then they introduced them, and I was all like, "You're kidding me, right? The most boring car design in 40 years!" And later on I drove one. A college buddy had one. Most flaccid, underpowered, floaty, vaguely steered thing ever. Imagine...you're a "car guy"...you just graduated from college with an engineering degree...you get a job with Ford...and you get assigned to THIS. Imagine the months...well...weeks...ok, it was drawn on the back of a napkin during a beer soaked lunch...of design work which went into creating this automotive legend. I had a new Fairmont in 1979, company fleet car, it was pretty basic and the fuel gauge was inaccurate which I discovered meant you were empty when it showed one quarter full. At around 30,000 it started to periodically drop a chunk of carbon off the inside of the cylinder head. Sounded like some one was beating a hammer. The solution was to remove the air filter with the engine running, hold the throttle open and slowly pour in a cup full of water. This burned the chunk of carbon out and away we went. Never knew what the cause was but thought it might have been unleaded gas. It was traded in at 50,000. Probably still on the road somewhere. Sounds like the hype for the new Dodge Dart. I feel myself making a wincing face or grimace at this profile. It's like the "family car" you're able to buy in a very low resolution video game. The "sport car" in that game would probably be a featureless yellow 1995 Camaro or Mustang. Ugh, I need to rinse this bad taste out of my mouth with some Top Gear. Well played, Tony. I'll get you back for this. Say what you will- I'd still love to drive it! The dent in the tailgate speaks volumes. I can picture your comment on an offical OPC t-shirt, Dave. "...The dent in the tailgate speaks volumes." This was my high school drivers ed car. I spent the summer driving the football coach around on errands in it learning to drive. One mean looking Fairmont. Perfect light patina, steelies 'n whitewalls, and a sizable dent in the rear tail gate. I dig it. *Zephyr...bah, this is why you don't comment when you're half-asleep! Please take my wagon off here. Not sure how or why you have a picture. It's not parked, it was just purchased being a daily driver! THANKS! PS,now it's fixed up a bit, and still been a great daily driver..so again, please take my vehicle off this site. Nobody asked to post the images I took right after I purchased it. Thanks again. I just noticed all the positive feed back on the 1978 Zephyr wagon on this same site. Interesting since mine is "Hella" cleaner, has a better engine, and was featured in a "Shins" video..but again, nobody asked to post my images. So please remove them! Hi Anon, the name of our blog doesn't imply that the subject cars don't run, quite the opposite. The whole inspiration was to celebrate the un-celebrated daily drivers of our childhood. 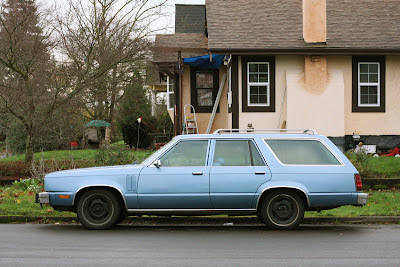 Bring up the oldparkedcars.com front page and I think the intent will be more clear.